FULL RACE REPORT AVAILABLE NOW HERE ON MY BLOG OR HERE ON MY WEBSITE WITH ACCOMPANYING VIDEO. Thank you to all of you for reading my blog and leaving comments. Brandy would pass those along to me. Having the support of you, my readers, while on Trans Iowa kept me motivated until the finish. Thank you Brandy for managing the blog while I was away TAKING CARE OF BUSINESS! I would like to share with you why I commented that Iowa is not flat. Please look at the elevation chart. 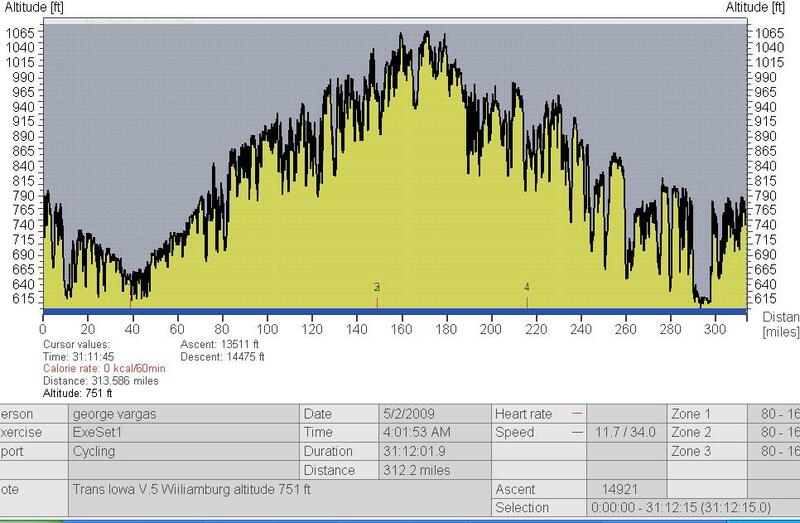 Our starting elevation in Williamsburg was 751 feet our highest elevation was only 1100 feet somewhere around mile 175. Yet we gained almost 15,000 feet. The elevation gain was done on literally hundreds of 30-50 feet of gain rollers. I think when people make the mistake to think that Iowa is flat they are thinking of the Interstate highway they traveled where the max grades are kept below 6%. This is not the case in the back country. There is no regard for standardizing the maximum grade. Many of these rollers were between 12-20% grades. Trust me my highly scientific method of calculating grade was on red alert non-stop. It works like this IF I’M IN MY GRANNY GEAR OF MY TRIPLE AND A 26 TOOTH COG IN THE BACK THEN THAT ROAD IS FREAKIN’ STEEP!